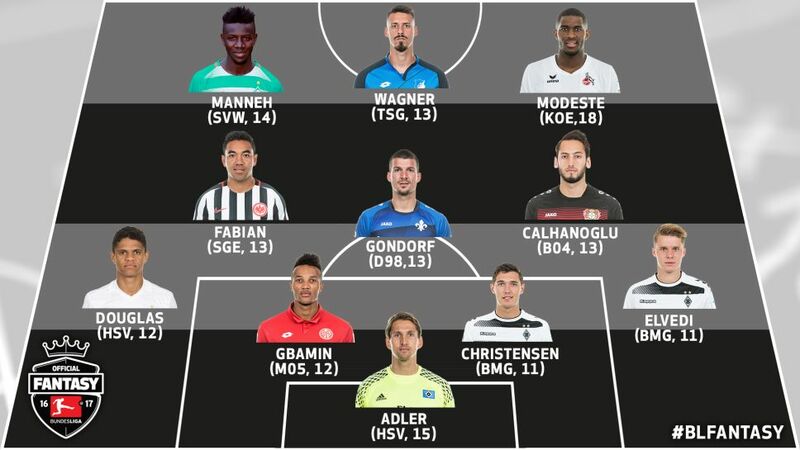 A watertight rearguard provides the foundation for the Matchday 7 Official Fantasy Bundesliga Team of the Week. The Bundesliga was back with a vengeance after the international break, with stars from across the league in action. The competition on Matchday 7 was tight - no team scored more than two goals, and four matches ended in a draw. Still, there were plenty of difference makers for Official Fantasy Bundesliga managers, and we've compiled them into our #BLFantasy Team of the Week for Matchday 7. Rene Adler (Hamburger SV, 15 points) – Any time you're in goal for a team that concedes 76 percent of possession and 22 attempts on goal, it’s likely to take a Herculean effort to maintain a clean sheet. Adler came up with just that in the goalless draw with Borussia Mönchengladbach, and even saved a penalty along the way. Anthony Modeste (1. FC Köln - 18 points) - With seven goals in seven matches, the Frenchman is the hottest striker in the league. True to form, he scored both goals in the 2-1 win against FC Ingolstadt 04. What’s more, he led the Billy Goats in tackles won with 13! Sandro Wagner (TSG 1899 Hoffenheim - 13 points) - Played a big role in helping keep Hoffenheim unbeaten for the season in a 2-1 win at home to SC Freiburg. He scored the opener and led his team in shots (5) as well. Ousman Manneh (SV Werder Bremen - 14 points) - Werder look to have unearthed a real treasure in this young forward from Gambia, who came to Germany as a refugee two years ago. Manneh scored the winner in front of the home fans and showed a prodigious work rate up front, matching Calhanoglu with a match-high six attempts on goal.